A scavenger hunt is a great add-on activity to a just about any birthday party for kids, tweens, or teens. It can also provide great fun to a family get together or family reunion, or when an activity is needed because boredom has set in. To help get you started in planning your own hunt, I've listed below several options from which you may select. Some hunts require you go elsewhere, others are set for your neighborhood, and some can even be done inside your home--they're perfect for a rainy day. Basically, all you need to do is to split your guests into teams and give each team a list of specific items that they must gather, photograph, or perform a combination of the two activities. Whoever completes all the requirements on the list first, wins. Half the fun of a scavenger hunt is doing the hunt itself, the other half is sharing your adventures with everyone else! However, coming up with scavenger hunt ideas can be a little time-consuming, so we've provided several scavenger hunts for you to select from. ABC Mall Hunt is perfect fun for kids, tween or teens! ABC Scavenger Hunt is easy as 123! Around Town Scavenger Hunt is a great way to burn off excess energy! Beach Scavenger Hunt is a great way to have fun in the sun! Beach Photo Hunt is a great way to capture your fun in the sun, with a beach-themed activity! Camp Scavenger Hunt is a great way to get kids excited about nature and inspire them to learn! Christmas Scavenger Hunt is a great way to keep the Spirit of Christmas alive and let the kids have a fun time! Graveyard Scavenger Hunt is a perfect hunt for tweens or teens! Magazine Scavenger Hunt for items or words can be played individually or in teams! Mall Scavenger Hunt for free items is fun, cheap, and a great way to occupy those raging hormones! Nature Scavenger Hunt gives everyone the opportunity to explore the great outdoors! Neighborhood Scavenger Hunt is an old favorite, but still waaaay fun! New Years Eve Scavenger Hunt is a great add-on for a News Year Eve or New Years Day party. Newspaper Scavenger Hunt works great as a rainy day activity or a fun party game. One Color Mall Scavenger Hunt is great fun where you find items in a particular color. Purse Scavenger Hunt Great ice breaker game. 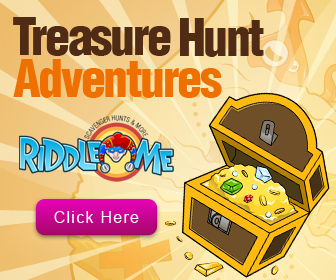 A "Treasure Hunt" for females only! Recycle Scavenger Hunt is perfect for a campout or a party with a nature twist!